Ashley's good taste in books paired with her ability to articulate precisely what rings true in a story make her reviews informative and appealing, and you can see this first-hand for yourself at her amazing book blog, Book Labyrinth. Today she's recommending Unbreak My Heart by Melissa Walker to you as your summer must-read. Welcome, Ashley! "To me the perfect contemporary young adult book will contain three main aspects: romance, family, and friends. I love to read books that combine these elements effortlessly, and Unbreak My Heart by Melissa Walker is one of those reads. It's a great summer read, as it takes place during the summer while Clem takes a sailing trip with her family. This book was so emotionally satisfying, whether it be during the scenes with Clem's adorable little sister, Olive, or the ones with new love interest, James. At the heart of this story, though, are Clem's experiences as she grieves for a lost friendship. The story goes back and forth between the summer and the past year as the situation with her friend unfolded, but it reads in a very natural way. 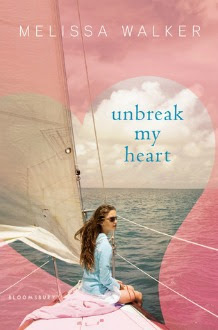 If you're looking for a beach book that has fun in the sun, but also delves a little deeper into relationship issues, then consider picking up Unbreak My Heart." Be sure to check out Ashley's full review of Unbreak My Heart! Personally, it's definitely in the TBR pile now that I know Ashley loved it so much. Let us know if you've read or will be reading this one!